There are lots of healthy alternatives to driving your car, and biking is quickly becoming the choice of city dwellers. Not only do they save our smog filled atmosphere, they also have the added benefit of giving the rider a great cardio workout. Even better, they are easy and cheap to park! 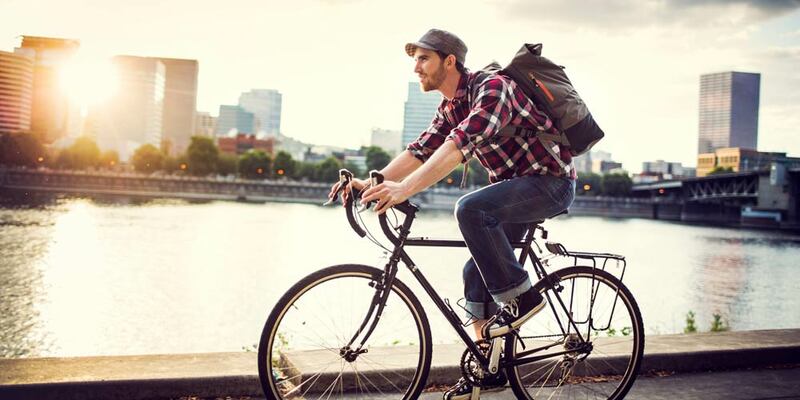 So if you want to combine your transportation needs with your fitness routine, read on and learn the pros and cons of urban biking. First and foremost, you need to get yourself a good bike. However, there are a few things that you need to keep in mind before you head down to your favorite bike shop to buy your new chariot. Depending on where you live in relation to where you work, some bikes may be better than others. The longer you are on the seat, the type of terrain you must traverse (is it only city streets or is there some parks you go through? ), rough roads vs. smooth, and traffic density – all of these factors should be taken into consideration if you plan on biking on a regular basis. 2. How often do you plan on riding? If you only plan on using this bike on weekends, then you need to keep that in mind before you buy. Conversely, a bike that is used every day will have different requirements. Points one and two relate to the money factor. Don’t spend $5,000 on a bike that will only be collecting dust in your garage. Determine your needs, and then make your budget. You also need to keep in mind that downtown areas of major cities are notorious for bike thefts. The biggest difference between mountain biking on ‘real’ mountains and city streets is traffic. Depending on where you live, the motorists may or may not be used to dealing with cyclists. For example, if you live in a climate that has winter. Although diehards will bike in any weather, winter usually knocks about four months worth of biking out of the year for the rest of us. No longer just for nerds and overprotective parents, helmets are now available in lightweight composite materials and cool designs. Remember, when you land on cement your head will always lose the test of durability. 2. Shoulder check and signal before you turn. Although the vast majority of the human race has no idea what hand signals mean, they do realize that they mean something. The odds are that a motorist will at least be prepared to slow down if they see you holding up an arm. A quick glance into your mirror, or a shoulder check, will confirm that they are paying attention. 3. Be prepared to stop quickly. I knew this girl who once biked 10 miles each day to work. In order to avoid traffic she would follow a bus all the way into the city and back. One day she let her attention slip and she slammed into the back of the bus, breaking her neck. The point is to be aware and be prepared to slam on those brakes in an instant. Braking is good, but sometimes speed is even better. A fast, responsive bike might help you to avoid things like a car door suddenly opening, or a pedestrian who walks out in front of you. 5. Learn how to fall painlessly. No matter how aware you are, you will eventually fall or get knocked off your bike. The trick is to do it so you minimize the damage to your body. Ramming into something head-on is never a good idea, but you can fall and slide into it. You will get a little scraped up, but it beats a serious head injury. 6. Avoid swerving in and out of traffic. Most motorists hate bikers in the first place, so don’t expect them to be overly pleased if you decide to weave in and out of traffic. It only takes one u-turning cabbie to take out you and your bike. Most major cities impose the same rules on bikes that they do on automobiles, so your best bet is to play by the rules. 7. Buy a good lock. Thieves love to steal bikes, so be prepared to lock up your bike everywhere you go. Your best bet is to get the bar locks instead of the cable kind. Plus, make sure to remove your front tire and seat. Although biking is healthy, breathing in automobile exhaust is not. You may want to consider buying a good mask/filter. If you live in a city with smog alerts, make sure you have the mask/filter on if an alert is posted. Bike seats have been known to damage the human body. Men are especially vulnerable – prostrate gland, coccyx, and the internal pudendal artery. The repetitive pressure can lead to penile numbness, nerve damage, and possibly prostrate damage or cancer. So look for the new generation of seats, which are wider, made of a softer material, and have a ‘trough’ for your prostrate. Another way to avoid the pressure on your backside is to buy a bike with built in shocks. The shocks are great for off-road biking, but they work just as effectively on curbs and rough roads. By googling ‘cycling in the city’ a host of city websites popped up offering information on specific areas. Check out the World Wide Web For more information about urban biking in your city today! Booze & Dieting: Are They At Odds?